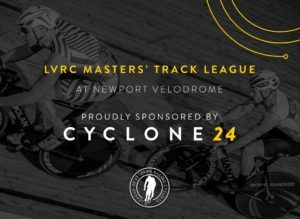 We are delighted to announce that Cyclone24 will be sponsoring the new LVRC Masters’ Track League to take place at the Wales National Velodrome this Autumn. The LVRC (League of Veteran Racing Cyclists) is an independent body which was established in 1986 to provide a programme of competitive and social cycling events for members aged 40 and over. It is the only organisation in the UK dedicated to providing cycle racing across most disciplines for the 40 plus age group. Races and National championships are available in 5 year age bands across most cycle racing disciplines for men and women. The league will be held on Friday nights at the Wales National Velodrome throughout October and November this year. So whether you’re an experienced track racer looking to fit in some race training before a championship, or a track rider wanting to try out racing, this series will give an opportunity for some friendly but competitive racing as it gets colder and wetter outside! A 2-hour open session for Masters will be held immediately before each Track League, aimed at training and race preparation. Entry will open on RiderHQ on Friday 10th August. Closing date for advanced entry: one week before each session. Cyclone24 Director, Zoe Westerman commented “Having a dedicated league shows that we adults of the 40 plus age group are far from past our use by date! Cycling gives the same rewards irrespective of your age, gender or ability and this is why we are delighted to be supporting the LVRC Track league at the Wales National Velodrome, where the Cyclone24 challenge first started”.